You probably know this principle from your economics class in school: using raw materials, a business produced a product, sells it to the next business until it finally arrived at the consumer. This is where the old school “business cycle” ends. A cycle? Usually not. In most cases, it’s a waste-production line. The Story of Stuff shows us that the used product is not really thrown “away”, but that it’s waste. It’s like a tapeworm: the economic system eats up the raw materials and leaves waste, while the patient – our planet – is only getting sicker. This is of course something everybody knows more or less. Here we get to the next level: how about the money? How does it behave in this “cycle”? How does money move around in the business cycle? What happens in terms of money when the tapeworm leaves its wastes? Nothing. This is for free. Or, at least, he won’t have to pay extra for that. So her we are with exhausts, litter, plastic soup, CO2, nuclear waste and so on. 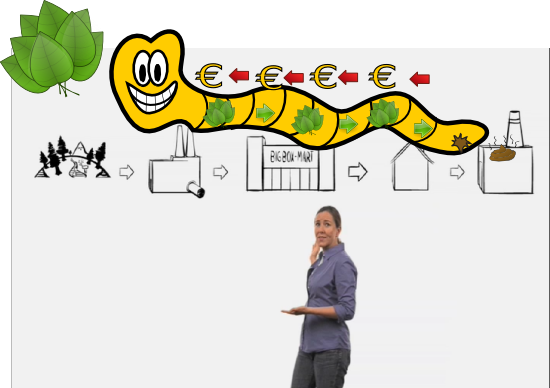 There is no money-back for your waste function built into the economic system. Does the business digging up raw materials need to pay for that? No. Well, sometimes they need to buy a “permit” but generally, nature is acquired for free. Water, fis, coal, gas, oil, air. Just grab it. No payment involved. And, to who would that be? 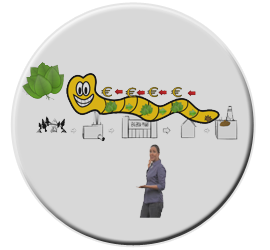 The left side of the image shows how the tapeworm is depleting the earth’s resources. We experience this as a set of big problems, such as the felling of the rainforests. On the other side, the tapeworm leaves its waste problem, which we recognize also on a daily basis. The money system is linear, not circular. Both the depletion of raw materials and the waste problem are symptoms of this deeper cause. Therefore we say: a circular currency for a circular economy.